Grupa LOTOS and Elektromontaż Gdańsk S.A. have signed contracts for the delivery of distribution boards to the main power supply building of the EFRA units, upgrade of the existing electrical substations, and construction of cable networks as part of the EFRA project. The works will be carried out from June 2016 to July 2017. The value of both contracts is over PLN 14 million. Thanks to the expansion of the power system, it will be possible to incorporate the deep oil conversion units currently being constructed under the EFRA Project into the Gdańsk refinery in a timely and smooth manner. The contract provides for a special time discipline for the delivery of new distribution boards and the upgrade and installation works on the power facilities. Thanks to good work organisation and an appropriate external service contracting process, the EFRA Project has been progressing ahead of schedule. Considering the design work, purchase of materials and equipment and the construction and assembly work, the progress of work is over 20%, which means that the implementation is 3% faster than scheduled. The expansion and upgrade of the power grid is necessary to include the new oil conversion units under the EFRA Project into the refinery’s power system in a proper and safe way. Elektromontaż Gdańsk, the contractor selected to perform the work, is appropriately qualified to carry out power engineering projects and has vast experience in the implementation of such projects for refining sector companies. “Grupa LOTOS chooses experienced Polish contractors responsibly. Under the entire EFRA Project, the majority of work will be performed by Polish companies and Polish employees. The Polish market will also play an important role in materials and equipment supply,” says Grzegorz Błędowski, the EFRA Project Director at Grupa LOTOS. Reliable partners guarantee scheduled implementation of the new investment, without compromising the security of the refinery operating nearby. The choice of a Polish contractor, who has strong competences in such projects and who knows how LOTOS operates, guarantees meeting the deadlines and maintaining proper work quality. The EFRA Project is implemented under a very strict schedule. There are only 32 months between signing the contract for the construction of main units and their launch. For now, it is assumed that LOTOS will complete the project on schedule. “The EFRA Project is strategically important for LOTOS as it materially expands our production base, increases product volumes and has a positive effect on the margin. Therefore, it raises the Company’s competitiveness, both on domestic and foreign markets,” emphasises Mateusz Aleksander Bonca, Vice-President of the Management Board, Chief Strategy & Development Officer at Grupa LOTOS. 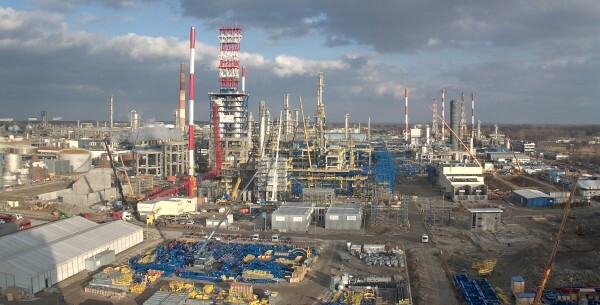 The total cost of the deep oil conversion complex built under the EFRA (Effective Refining) Project is approximately PLN 2.3bn. When completed, the complex will increase the distillate yields at Grupa LOTOS and, as a consequence, will boost its refining margin by approximately USD 2/bbl. The EFRA units are expected to add up to 900,000 tonnes to the LOTOS refinery’s annual fuel output. The project works are scheduled to end in March 2018.